On any road and in any weather, this was the thought behind the Sidi All Road GTX Boots. The rugged design coupled with a full GORE-TEX waterproof-breathable membrane means this boot will take anything the road throws at it. Designed to meet and exceed the needs of ADV riders the All Road boots are not just confined to one segment. Their rugged yet compact design is perfect for nearly any type of riding, offering comfort and protection to a wide variety of riders. I have ridden with these boots for a month now. The are very uncomfortable, feet sweat during hot weather, and riding through several rain storms, DO NOT keep your feet dry. AS of this date I have not ridden with these boots yet. They are replacing a set of harley 16 inch riders. Just trying them on and walking around the house, they are light, and feel good on my feet. Not to tight or lose, you can stoop, bend twist around without hurting.easy on and off. Will up date as soon as I use them. they look great and think they can be used all day . insole is a little thin, but that's it for now. These boots are made with synthetic leather which seems to be unable to stretch or conform to my feet. I have already worn the boots for 100's of hours and more than 6,000 miles riding and they are as stiff as the day I bought them. I long the the real leather of past boots. I will be putting these on the shelf until I can give them away as the pain and blisters they continue to cause is not bearable. If you have perfect feet, they are probably a good boot. It is not a bad boot - it is comfortable but no where near the quality of the On Road that it replaced - I am sorry Sidi dropped the On Road, the fasteners on the All Road do not appear to be as rugged, the all leather on the On Road was of better quality and offered more protection as well as comfort - Obviously price was a consideration and Sidi felt that road riders did not want top quality boots - I believe they made a mistake. I bought 1/2 size large so I could add a gel insole, and it fits well. Always had pull on or side zip boots before, so the hook and loop (Velcro style) closure takes a bit getting used to, but aids in ensuring a good fit. Pricey, but better than my old H-D's. I purchased these as a hopefull replacement for my 20 yr old OnRoads which needed more than just new soles. From the moment I put the AllRoad boots on I knew they were not the answer for me but I needed boots for a trip. I had hoped they would become more walkable after some break in. Never did, so the toebox area is a bit tight. The top of the boot needs to open up more to make entry/exit less of an effort. Have owned these 60 days now and I love them. Purchased these because of the gortex and I could walk in them with no discomfort. Wore them to motorcycle safety class for two days nine hours per day. A lot sitting and riding but they never bothered my feet. Going to purchase a different pair for my dirt riding. This boot is a Sidi replacement of the On Road. I bought to replace my 15 yr old On Road boots. I have a wide foot EEE sometimes EE depending on manifacturer. I ordered the same size as my old ones. They fit fine and are comfortable. I’ve only worn them a few times. I did find one foot was more difficult to get on and off ,perhaps it’s slightly larger than the other across the top of the foot,YMMV,. Was easily solved by opening the bottom two pieces of Velcro buckles more. I don’t think these will stretch a lot like the previous all leather boot, but they appear well made. I can’t speak to waterproofing as I e not ridden in the rain yet. A good boot and happy with my purchase. I bought the boots in February 2017 and ride everyday, rain or shine and did a 3000 mile trip in May. On the plus side, the fit is good, warm in cold weather and they repel water very well. On the downside, the soles of the boots are pretty severe which have a tendency of catching the pavement on tight turns, pulling my foot back off the foot peg and the velcro straps are wearing out very quickly. I need to reattach them all the time which is very annoying. I will never buy a set of boots without a zipper or buckles. Excellent touring boots. Comfortable, made well, fit well. The velcro flaps are good and they hold up well in extremely tough conditions. I'd buy them again. need water proff winter boots, i live in the pacific northwest. Super comfortable boots for all rides. They are lightweight, comfortable and I have sweaty feet, so the Gore-tex is great! I got them to replace my Icon Elsinores. They're the closest thing to an almost breathable adventure boot. Not quite an adventure boot, but Sidi makes these small enough for womens' feet and this is the most attractive option. I love these boots! I just wish they had a loop on the back to assist with pulling them on. Sizing is very close to Alpine Stars. Wanted the taller boot. Fits perfect. I purchased another similar style of SIDI boots 12 years ago and loved them. They are ready to be replaced. I already own this boot, and have worn them out. I love them. Because it is leather free (cruelty free) and appears to be of very good quality. I bought a pair of Sidi On Roads and have worn them since 1998 and they have been spectacular I figured after 17 years it was time for a new pair as the old ones were just starting to break down. I think is the happy medium between the my Txc street boots and my Gaerne 12. Light weight, waterproof, breathable for the tropics and still has enough protection. Will try them and see! They looked like a good compromise between breathability and protection. They are easy on/off with my high arches. Recommendation from a friend. They are very comfortable but I had to go up 1/2 size. Highly recommended to me by a friend who does a lot of touring, road and ADV. Also great reviews on RevZilla and the informational video. Foot protection, style and weather durability. Five hours in the rain at 38 degrees makes Pete's feet very unhappy! Haven't had wet feet since I've purchased these boots! Highly recommended and good reviews. But returned. I am between size 46 and 47. Wasn't comfortable. I was looking for waterproof touring boots and had settled on Sidi finally narrowed down to the All Road based on other positive reviews and Revzilla reviews. Needed to replace boots. Ride just about everyday and need a versatile boot that is comfortable in the cold, hot, and rain. Sidi's reputation attracted me to their boots. Watched several of your videos. Specifics of the boot were explained well and I like the styling. I was interested in the On Road as well but did not see it on your website. Wanted waterproof boots and I have to say I love this things. One thing you need to get is socks that are long enough. I tried to use shorter socks and they started to rub my leg at the small soft leather top. I don't know why but it only did it to one leg in one spot. Still best boots I own and the fit is perfect. I have another pair of Sidi riding boots I purchased many years ago. Expensive boots, but I've had so many other 'riding boots' that simply failed in the one area I had to have: waterproofness. Every other brand of boot I had tried that claimed to be waterproof simply weren't. 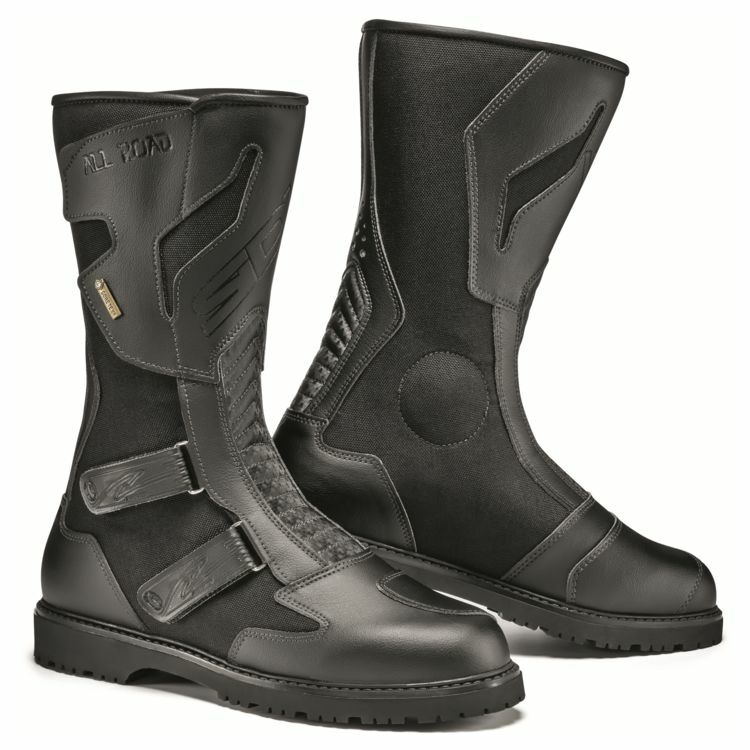 I Googled for waterproof motorcycle riding boots and found Sidi. I was skeptical, but a friend of mine swore by the Sidi brand, so I gave Sidi a go. I was not disappointed one bit. Best riding boots I had ever purchased. I read the reviews, watched the videos and am satisfied that this is the boot I need! That's a great looking boot. Will it be available in wide widths too? I'm curious about this boot and the other Sidi boots made from techno whatever, not leather. Are you seeing any downside to the imitation leather product? BEST ANSWER: Actually only positives....i'm getting near a year of regular wear (3-5 days weekly) & these boots appear real close to new. The technomicro does not age/patina like leather, which could be a detractor for some...not me. A damp microfiber towel every once in a while & clean! I'm getting due for new insoles but otherwise the sole & uppers are great. Had the boots for 10,000 miles and they wear very well except for the velcro straps. Needs buckles. How do these do in cold weather? Description says the Gore-Tex breaths and keeps rider cool in warmer weather. Does that translate to letting cold air in during winter riding? BEST ANSWER: I wouldn't really say they "keep you cool" in warm weather at all, but they don't get as stuffy as you'd expect. They are a bit warmer than a non-waterproof boot in the summer, and in the winter they'll keep you dry, but you'll want a second pair of socks if you're riding below about 40°F. The Gore-Tex "breathes" in that it lets water vapor out, so your feet don't get clammy with sweat. But the boots aren't really ventilated like a true "Summer" boot. I wore these down into the 40°s (Fahrenheit) and they were quite comfortable. Wear warm socks. Boots are warm in cold weather and dry if cold and wet. I’ve had mine for two years and ride year round with these boots. Toe box and instep look a bit big/high...how's the clearance under the shift lever? BEST ANSWER: I have about 12,000 miles on mine, I have not had a problem with it at all. I am riding a 2017 1200GSA and the shifter is adjustable but there seem to be plenty of room. I have no problem at all on my BMW R1200GS. Fits comfortably under shift lever. Had them for about a year and very comfortable. Great boots. Is the sole on the "All Road" replaceble? Thanks! Is this boot the same height as the Sidi On Road boot? Are there structural differences between the Sidi All Road and the On Road boot ? BEST ANSWER: The Tour is a traditional full height boot. The All Road and On Road are taller yet(plus 2-3 inches taller). However, also note that the Tour has a stiffer shin than the others as well. will this fit comfortably inside whatever riding pants you are wearing? BEST ANSWER: Yes, I wear them regularly inside some Alpinestars AST1 pants as well as inside of jeans. The top cinches tight to your calf. yes, these boots fit closely around your calfs and easily allows pant legs over them. i haven't had a problem with either pair of the riding pants that I have. Did this boot replace the on road? BEST ANSWER: Yes they did. Had the On Road for about 15 yrs. decided time for new boots. Ordered the same size as my On One foot was difficult in putting on likely a bit bigger than the other.One tip if that should happen just slide the two lower Velcro pieces up more through the metal ring. They fit fine and are comfortable. Glad I got them. BEST ANSWER: A little over a foot high. It comes up to the middle of my calf. The closure is completely adjustable so it can be snugged down without being too tight. How big around is the *interor* of the boot at the ankle and widest point of the calf? BEST ANSWER: The answer is that you can adjust the ankle and calf size to a full range in each area. I snug down the area around the ankle and go loose around the top calf to accept my pant leg into the boot. When I wear my pants out of the boot, I snug the top down to allow the pant over the top of the boot. Very adjustable and the most comfortable boots I have ever owned.